The Cutera Medical CoolGlide Excel is the first clinically effective Nd:Yag laser for treating a wide range of vascular conditions, including lesions, discrete vessels, high pressure vessels and deep veins. Cutera is a company based out of San Francisco that makes aesthetic lasers and light products for hair removal, non-skin removal, fractional skin resurfacing, and vascular issues. The company also has products and treatments available to get rid of skin redness, large and unsightly pores, and pigment issues, all with no scheduled downtime. Cutera works primarily with physicians who specialize in cosmetic solutions to these and other aesthetic issues. The Cutera Medical Coolglide Excel is, according to dermatologist Suzanne Kilmer, M.D, “One of the best lasers for vascular treatments.” More specifically, the Excel is capable of treating everything from erythema and red vessels, to large blue or black vascular lesions. The Excel treats affected areas in the face, neck, and chest. The laser works just as effectively in the lower extremities, too, where it can improve or eliminate vascular disorders in the legs, ankles, and feet. As its name suggests, the CoolGlides cools and soothes your skin during the treatment process. 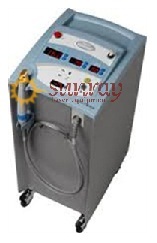 SunrayLaser.Com offers many Cutera Medical products in brand new and refurbished condition, including the Coolglide Excel. We are the most reputable and trusted online source for buying refurbished aesthetic laser products because we not only offer significant discounts off of retail costs, but our technicians have been trained in cosmetic lasers. We also offer free quotes on every laser machine you need, for inquiries please feel free to reach out to us using the contact form below.